Bei der Querfeldein-Weltmeisterschaftin Bogense verteidigten Sanne Cant und Ben Tulett ihre Titel - Wout van Aert fährt zu Silber. Dazu zahlreiche Top-Ten-Platzierungen auf Super Prestige. 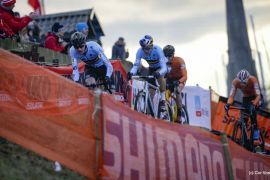 At the end of the Cyclocross World Championships in Bogense the long-expected duel between Mathieu van der Poel and Wout van Aert – between the most-outstanding rider of the season and the reigning World Champions – was finally on. 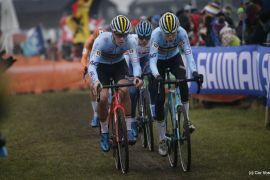 In the first lap a lead group of eight riders mostly from the Netherlands and Belgium had formed, only one rider from Spain shook up the almost all orange and blue picture. 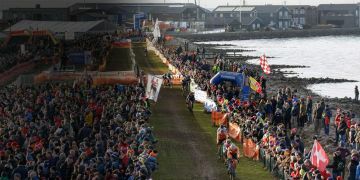 On the fast course the group remained together for a long time until in the third lap Mathieu van der Poel went for the decisive attack after having tackled a climb in superior fashion. His competitors had to dismount though, therefore losing valuable seconds. 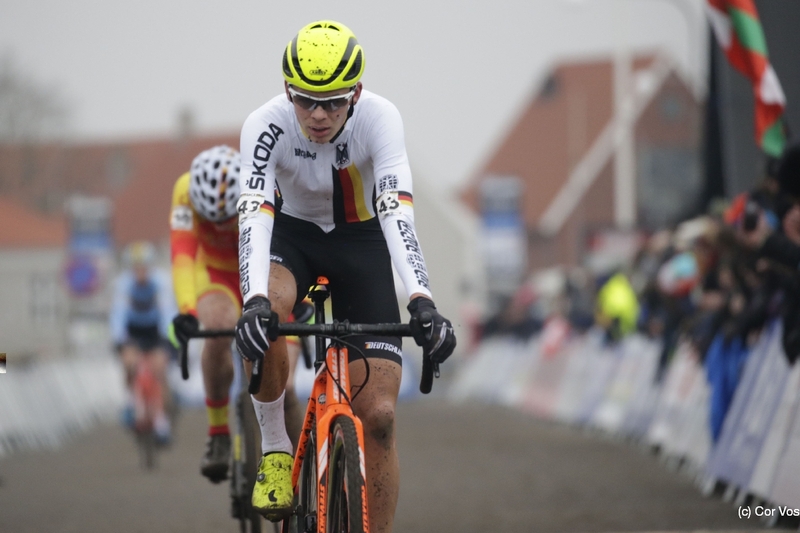 Wout van Aert went for the chase shortly after also dropping the group. In the fifth lap he had caught up to his rival and both rode the consecutive half lap together. The climb to the top of a dike with the Church of Bogense in the background became the key section of this race: Again, Mathieu van der Poel rode the climb on his bike with his rear wheel slipping occasionally only. Wout van Aert had to dismount, though, which cost him four seconds. 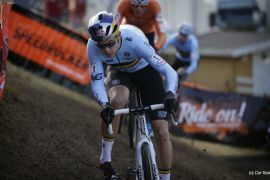 He was able to stay within visual range, remaining the only rider who could have posted a threat to van der Poel. During the course of the race the gap grew up to 35 seconds while Toon Aerts, the current Belgian Champion caught up to Wout van Aert. Both attacked over and over and each time one answered the other one’s attack. In the final lap Aerts was ahead by a couple of meters when he slipped in a curve, so van Aert passed him and secured his second place. 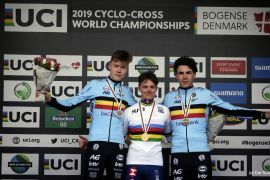 After an almost flawless race – only in lap nine he was forced to dismount at the aforementioned hill – Mathieu van der Poel becomes World Champion for the second time after 2015 (when in Tabor he also won on a STEVENS Super Prestige). Congratulations! 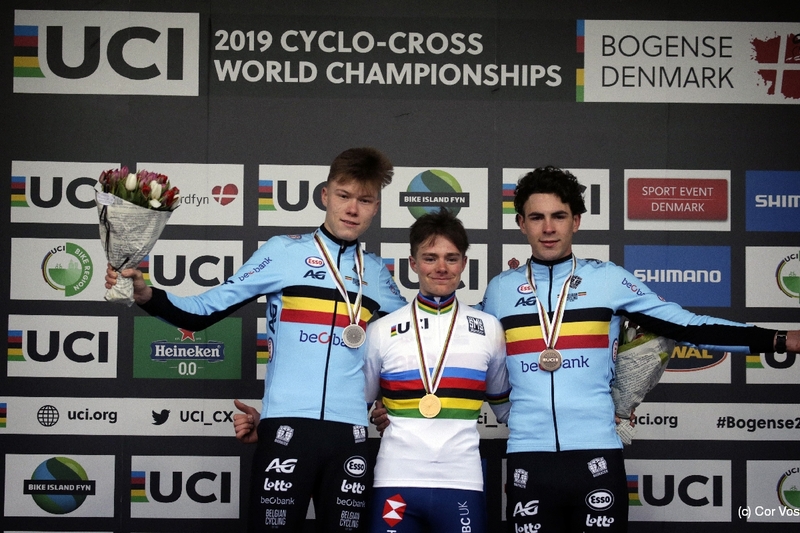 Wout van Aert was one of the first to congratulate the new Champion truly sportsmanlike and on the podium he eventually was even able to smile again. 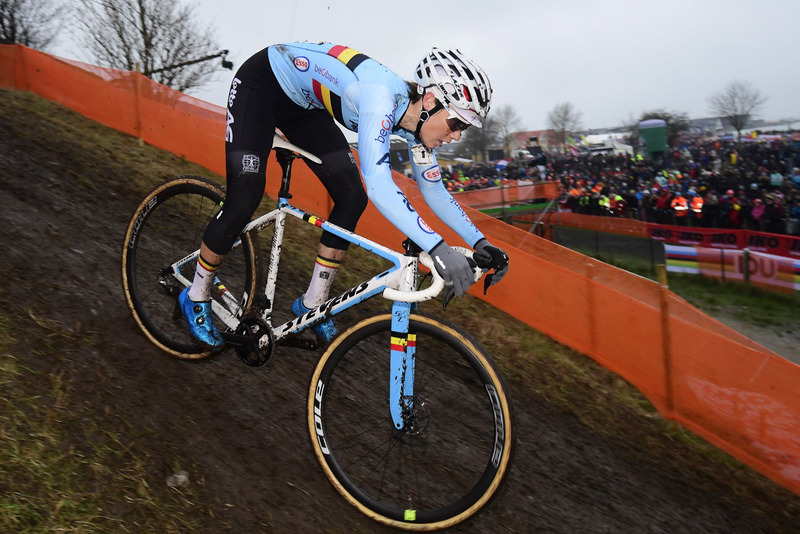 Behind Wout van Aert other STEVEN Super Prestige riders rode to strong top ten finishes: Laurens Sweeck and Jens Adams of team Pauwels Sauzen Vastgoedservice come in at fifth and ninth, Gianni Vermeersch of team Steylaerts 777 finishes a good tenth. Beste German rider is Marcel Meisen in a respectable eighth. Also congratulations from all of us! 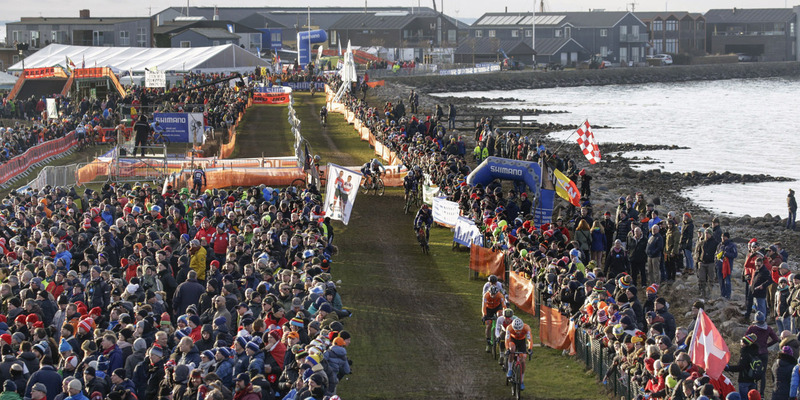 The Women’s Elite race was as thrilling as it could get - undecided until the very end with lots of lead changes. 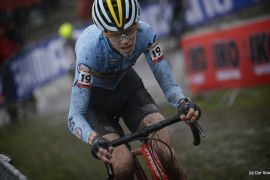 Sanne Cant was the only Belgian rider to stand a chance against a strong Dutch team. 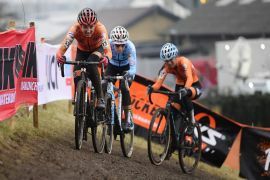 Marianne Vos, Lucinda Brand, Denise Betsema und Annemarie Worst (Steylaerts 777) were in a lead group together with last year’s winner on a very fast course with many short but obnoxious climbs. The lead changed throughout the race with no rider being able to break away by more than a narrow margin. An attack by Lucinda Brand eventually split the head group with Brand and Cant in front and Vos, Betsema and Worst in the hunt but steadily falling behind. 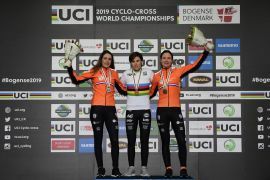 In the final lap it was Cant whose tactics had worked out perfectly to make the most out of her technical strength and cross the finish line first with nine seconds ahead. 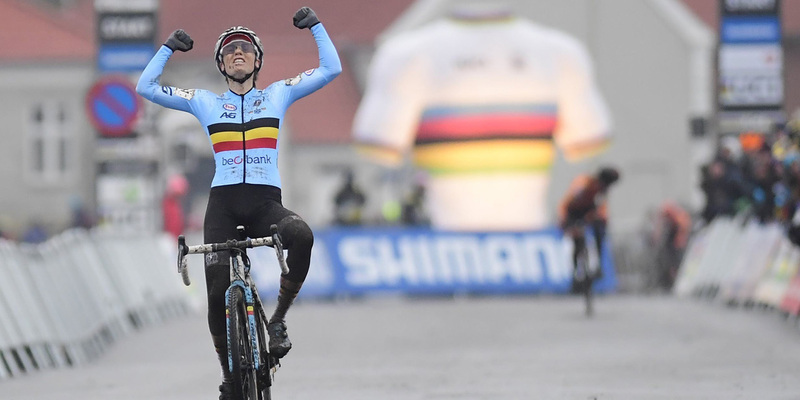 On the podium Sanne Cant then held up three fingers – for three world championships in a row (and all on STEVENS Super Prestige). She was joined by Lucinda Brand ahead of Marianne Vos both from the Netherlands. 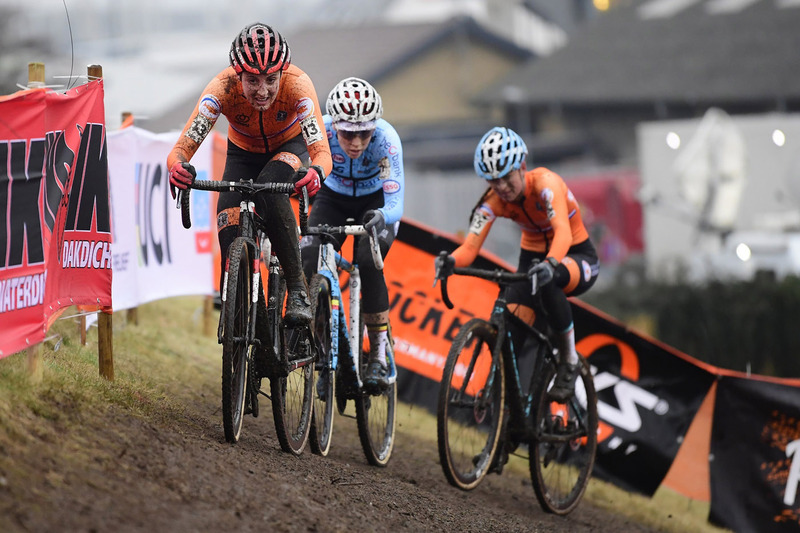 Vos had ridden a strong race from the front and thereby confirmed the strength she had shown all season. Her team mate Alice Maria Arzuffi (ITA) finished a respectable 12th. Also on STEVENS’ top-of-the-line ‘cross bike, Loes Sels came in 14th. 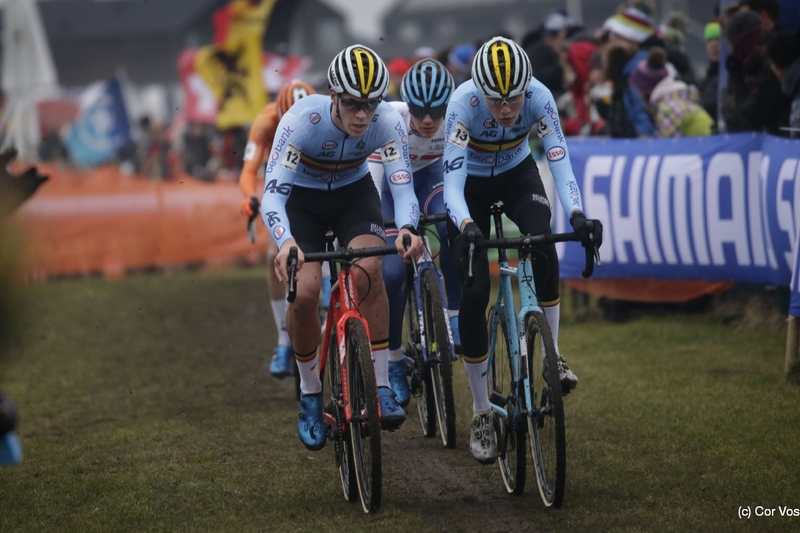 The first competition of the worlds in Bogense was the U19 Juniors’ race on Saturday morning. 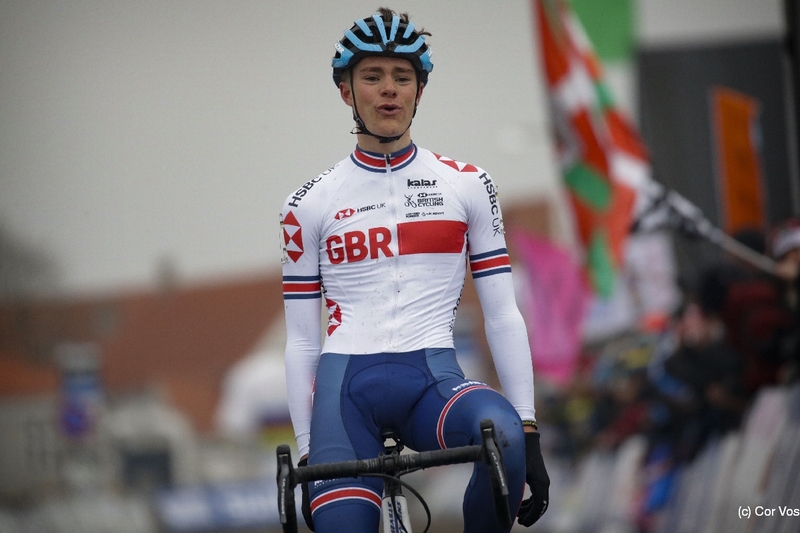 Here, Ben Tulett (GB) managed to defend his title from his first Juniors’ year successfully – a feat previously only accomplished by Mathieu van der Poel. The IKO-Beobank rider was at the front of the race early on, and after about a third of the distance he managed to break away from a larger group that had gathered shortly after a hectic start, together with Witse Meeusen and Ryan Cortjens (both Belgium). Of these three Ben Tulett was the best to handle the fast course with many hill crossing – he stayed in the saddle longer than his competitors, who dismounted more often, therefore increasing his lead lap by lap to up to 30 seconds ahead of Witse Meeusen and his own team mate Ryan Cortjens. 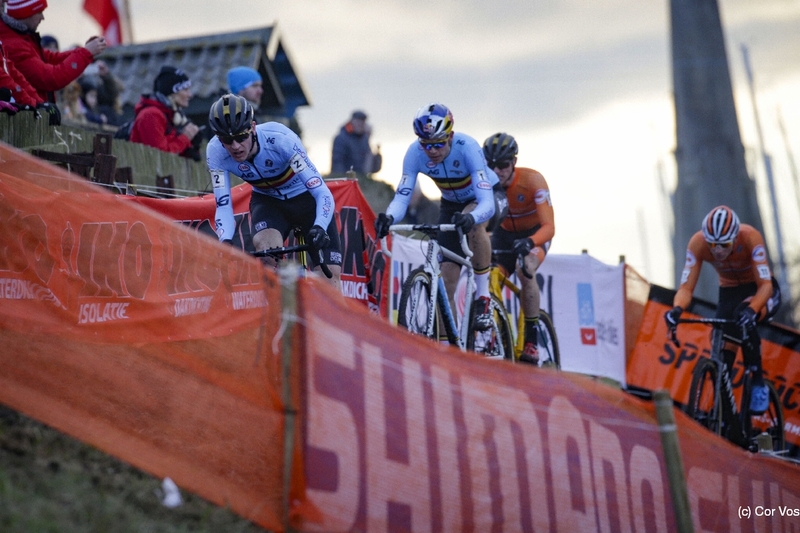 Besides Tulett and Cortjens other STEVENS Super Prestige riders finish in the top ten: Tom Lindner of STEVENS Racing Team performed strongly in the chase group and finished sixth. Lennert Belmans (like Tulett and Cortjens IKO-Beobank) comes in eighth and Jakub Toupalik from the Czech Republic in ninth. Tom Lindner’s eventual rank says less about his performance than the race he rode. In the bustle at the beginning of the race he had crashed and was forced to start his chase from the very back of the pack. When he finally had caught up to the lead group, he should have taken the time to take a deep breath, as he said later. This was impossible though due to many attacks by riders in front of him. Gap after gap opened and he eventually he could not manage to close all of them. So with his sixth place he can be pleased – just as with his complete season – even if he was not as lucky as he had wished for. In the U23 youth race Thomas Pidcock continued the success of the British squad. 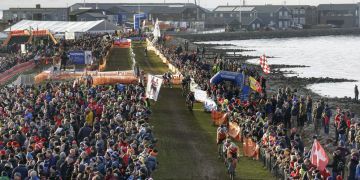 He wins 15 seconds ahead of last year’s winner Eli Iserbyt (Belgium) und Antoine Benoist from France. 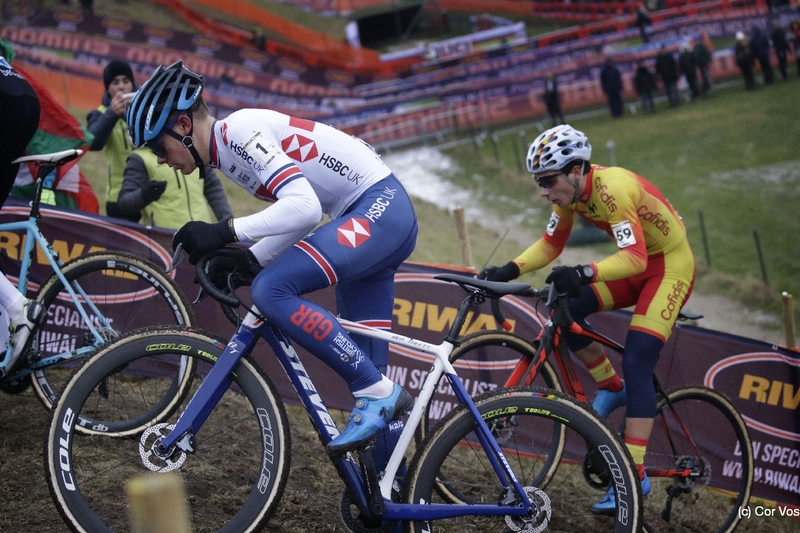 Tomas Kopecky (Pauwels Sauzen Vastgoedservice) from the Czech Republic rides his Super Prestige to a very good fourth place.